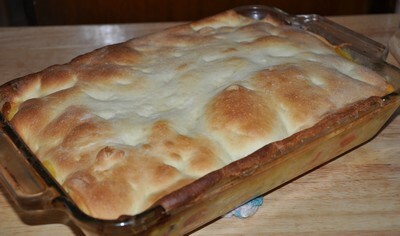 Here is a great recipe for chicken pot pie. 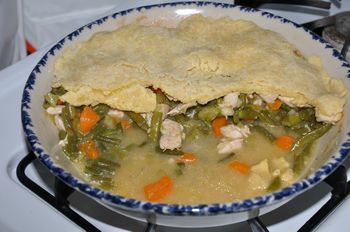 You can change this recipe up by making one large pie or try individual pot pies. 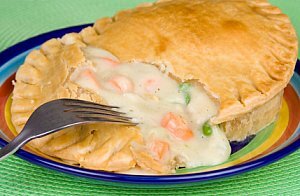 Don't buy the frozen pot pies that are really high in fat and preservatives. All you have to do is use this recipe and prepare them in mini tin foil pie plates or small ramekins, if you're lucky enough to have some. You can also cut back on calories by cutting out the bottom pie crust. Fill your pie ingredients on the bottom then add your crust on the top. Don't forget to add slits or use a mini cookie cutter to cut out a shape for the top crust. Sprinkle the table with flour and roll out a ball of pie dough into a small circle. Place dough into a pie pan. Roll out the second ball of dough into a circle for the top crust, set aside. Add vegetables, chicken, and cream soup or homemade sauce to a mixing bowl. Spoon mixture into pie shell. With the second circle use mini cookie cutters or cut slits in the circle. Top pie with second pie crust. Cut off the excess dough around the edges and pinch the edges together. With a pastry brush, brush tops of pie with melted butter before cooking. Bake at 375 degrees for 30 minutes or until crust is golden brown. Replace this homemade cream of chicken soup with the canned version. This is a lot healthier than the canned soups. And personally we like it a lot better than the canned cream soup! In saucepan melt butter. Whisk in flour until thickens. Whisk in chicken broth and pepper. Bring to a boil until thickens. Whisk in milk and again bring to a boil until thickens set aside and allow to cool. Melt butter in skillet. Add onion and cook until transparent. Add frozen vegetables and cook until vegetables are done per package. Add cheese, cream of chicken soup, cut up Rotisserie chicken to skillet and stir well. Transfer mixture from skillet to baking dish. Top with refrigerated crescent rolls. Arrange however you like. Cook for 15 minutes at 350 degrees. Let cool for 3 minutes and enjoy. If you want to save time and calories make your chicken pie filling and leave off the pie crusts. This makes an easy chicken casserole. I used all fresh, not frozen vegetables, so I precooked the vegetables in water for about 5-10 minutes until they were slightly tender. I cooked the chicken and chopped it into pieces. Toss the cooked chicken and vegetables together. Mix your cream of chicken soup with the mixture until well combined. Heat about 10-15 minutes until warmed. I often prep this the night before, stick it in the fridge wrapped. For dinner place in the oven at 350 degrees and bake 15-20 minutes until warm. In skillet, brown chicken and season with salt and pepper. Add onions, carrots, green beans and celery and continue to saute several minutes. Pour in chicken broth and cook one minute. Whisk in flour and let simmer 15-20 minutes until thickens. Meanwhile prepare topping below. After mixture thickens, pour in casserole or pie dish. In mixing bowl, blend together all ingredients. Pat or roll dough into a circle. Place on top of your chicken mixture. Bake at 350 degrees for 20-30 minutes until cornbread is done. 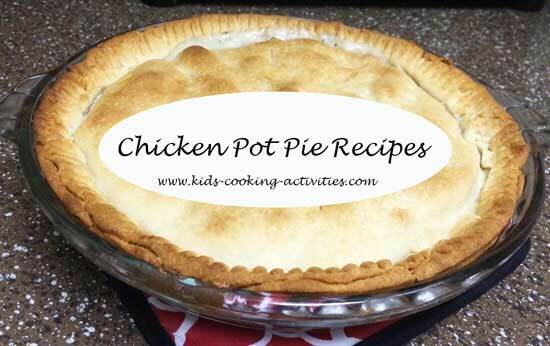 Create a chicken pie kids cooking party!